We’d love your help. Let us know what’s wrong with this preview of The Orphan and the Thief by M.L. LeGette. To ask other readers questions about The Orphan and the Thief, please sign up. This book was about a thief who broke into a mans house to steal a statue made of emeralds and shaped like a dragon. This guy was named Mr. Owl, who in my opinion was a jerk. The thief tried to steal the ingredients from a shop. The orphan worked at the shop. None of the ingredients were there, but the thief lied to the orphan and said he was getting paid to find them. So they teamed up and went in search for them. These ingredients were very hard to find, considering one of them was a unicorns hair. In their search to find these rare ingredients, they were up against a cave blob monster, a unicorn, a roc, an ogre, and many more. This was a very adventurous book that I really liked and was one of the best books I've read. The ending was a real surprise. Thanks for sending it to my mom for me to read. In the light from the rising moon, a miniature statue shimmered on a pedestal: a statue of a dragon, carved from an enormous emerald. He nearly tripped over his own feet in his haste to reach it. He stretched out his hands. His mouth went dry. A dazzling light flooded the room as a door swung open. Toad froze. His stomach dropped through the floor. His arms were still raised, inches from the statue, but his eyes were transfixed upon the giant figure standing in the doorway. The next second a great blast of hot light erupted over Toad and Jed, but they didn't stop. Toad was trying to punchevery bit of Jed that he could reach. There was a great howling of fright and a heavy-booted foot nearly missed Toad's fingers. Jed knocked Toad off him and rose to his feet. He swung his foot back, readying to kick. With a roar, Hazel flew at Jed. Her sharp claws latched onto his back, piercing through the leather vest. Jed roared in pain. His hands scrabbled for Hazel, but she flew in the air, beating her wings against his face. With a bellow, he turned on his heel and raced out of the pub. Hair from a Unicorn- booyah! A creature--a frightfully, awful creature--was mere feet from her. Its eyes were enormous, the size of goose eggs and milky white. Its gray, slippery skin was stretched taut upon its face. Its mouth was wide and full of needle teeth. Its hands rested on the rock, hands that were webbed and huge with each finger ending in a sharp, curved nail. It was as tall as a human man, yet oddly shrunken and hunched. (he had the whole page highlighted so I cut it down :) he says this was 'super descriptive'! Mr Owl was standing before them, blocking their progress, a pistol pointed at Jack's chest. Wonderful. I'm stranded with the least creative Ramblers. There was another thing he wanted to share, but I'm trying to teach him spoilers aren't cool lol. I'm pretty sure the itty-bitty dragon on the cover is what attracted me to this book. If you don't know by now, I adore dragons and the dragon in this book was about as adorable as dragons come! Add on the great lead characters and the magical adventures, and you have a really great book! Let's start with the characters. Toad was the "thief" in the book and my favorite from the very beginning. His ignorance (and denials) were just too cute. He was spunky and stubborn, and that just led to loads of fun (for me) when Melena, the orphan, entered the picture. She too was stubborn and quite the know-it-all (Hermione Granger, anyone?) She also had an ignorance about her and the two kids together were just the perfect pair. Melena was book smart; Toad was street smart. Perfection. Hazel, Melena's Spit-Fire dragon (YAY!) was like I said, adorable. But it was the talking beer mug, Joe, who most often stole the show. He was a total creeper, but could do magic that saved the hides of our hero and heroine more than a few times. Other characters that I really liked? Izzie, Becky and Horace. I won't say too much about them, but they were definitely nice additions to the story. The magic and adventure were really great in this book and I think young people would have a lot of fun with it (if I did, they definitely would). The world-building was what I would expect of a fantasy book and the writing was superb. The story was fast paced and never really slowed down. I will say that a problem I had with the book was that everything was so tidy. Each problem had a solution and the solution was easily obtained. I can't say that's how middle grade books are because I've read others with more complex problem-solving, like The Ascendance Trilogy by Jennifer A. Nielsen. But that was my only peeve about The Orphan and the Thief. Otherwise, it was well done. Wow! Now this is my kind of story! When I go searching for a book down the aisles of a bookstore or library, this is the type of story I hope to find. With lovable and odd characters and an adventurous story-line, this tale has all the qualifications for being an extraordinary classic. Come journey along side Toad, a thief, and Melena, an orphan, their sidekicks Hazel the tiny spit fire dragon and Ol' Joe, a cheeky talking beer mug. Trust me, it's an enchanting ride, facing magical and thrilling Wow! Now this is my kind of story! When I go searching for a book down the aisles of a bookstore or library, this is the type of story I hope to find. With lovable and odd characters and an adventurous story-line, this tale has all the qualifications for being an extraordinary classic. Come journey along side Toad, a thief, and Melena, an orphan, their sidekicks Hazel the tiny spit fire dragon and Ol' Joe, a cheeky talking beer mug. Trust me, it's an enchanting ride, facing magical and thrilling obstacles that will bring you to a surprising conclusion. I am so excited to announce that I will now be posting my fiction online in chapter by chapter installments! Find me as mlegette. Expect a new chapter every Sunday on Royal Road Legends, FictionPress, and Wattpad. M.L. Legette conjures up a captivating magical tale in The Orphan and the Thief. I loved this story and I could not put my Kindle down until I finished the last page. I hope there is a sequel. It is a beautifully told and written story. I fell in love with the characters, especially little Hazel, the Spit-Fire tiny dragon. Each charming character created by the author is so brilliantly drawn that each one captures the imagination and draws the reader in from start to finish. This charming story M.L. Legette conjures up a captivating magical tale in The Orphan and the Thief. I loved this story and I could not put my Kindle down until I finished the last page. I hope there is a sequel. It is a beautifully told and written story. I fell in love with the characters, especially little Hazel, the Spit-Fire tiny dragon. Each charming character created by the author is so brilliantly drawn that each one captures the imagination and draws the reader in from start to finish. This charming story is so good that it may very well become a classic. In the imaginary land of Calendula is thirteen year old Melena, the orphan, who has a talent for mixing magical potions and has been indentured for most of her life to Mr. and Mrs. Bell, the cruel owners of an apothecary shop. A twelve year boy named Toad, an irascible thief, has lived with a band of thieves, called the Ramblers, since he was a toddler. Together Melena and Toad embark on a quest, along with Melena’s irresistible little Spit-Fire dragon, Hazel, and a strangely charming and enchanted beer mug, called “Joe” that has the esteemed title, “The Thief Lord’s Beer Mug”. Melena’s greatest desire is to find her long lost brother, and Toad’s greatest desire is to save his “hide” from the likes of the evil Mr. Owl and his henchman, Mr. Ogg. Along the way, during their perilous quest, they were snatched by a Snatcher, barely escaped being eaten by Ogres, nearly drowned by a Slinkwing dragon, and almost murdered by Mr. Ogg. Fortunately, Agatha, a time-warping spider, and Joe, the Thief Lord’s Beer Mug, help Melena and Toad out of their most treacherous predicaments. In this enchanting tale, The Orphan and The Thief, we find that Melena and Toad discover a secret they never could have dreamed of and you will not want their story to end. This enthralling magical tale is chock-full of unforgettable characters that will warm the cockles of your heart. Oh my goodness! I loved this book! I know that it's mostly geared towards middle-grade children but even adults would enjoy this story. I was completely entertained and captivated by this book. The story itself was quite fun. Here we had two kids, Malena and Toad. Malena was an orphan who was looking for her brother and Toad was a thief who was terrible at his job. These two encountered each other and joined together to seek mythical items for a potion. Along the way, Malena and Toad came across Oh my goodness! I loved this book! I know that it's mostly geared towards middle-grade children but even adults would enjoy this story. I was completely entertained and captivated by this book. The story itself was quite fun. Here we had two kids, Malena and Toad. Malena was an orphan who was looking for her brother and Toad was a thief who was terrible at his job. These two encountered each other and joined together to seek mythical items for a potion. Along the way, Malena and Toad came across different obstacles. These obstacles as well as the journey, were described in a light and humorous way. As I read Malena and Toad's story on how they gathered up the ingredients, I found myself grinning from ear to ear. This book made me quite happy after a long day of work. Next, the characters were lovable! I was not able to pick a favorite since I simply enjoyed reading them all. Malena was the sweet and innocent girl who learned how to be more confident and become more adventurous. Toad was the clumsy boy who wanted to prove himself in being the best thief but ended up growing in a much different way. Then there were Hazel, Joe, and Agatha. Hazel was Malena's pet dragon, Joe was an enchanted beer mug (yup), and Agatha was a time-warping spider. These side characters really helped out Malena and Toad in their quest and reading how they did so was incredibly amusing. I read The Tale of Mally Biddle by M.L. Legette last year and loved it so I was excited to see that she had a new book out! This is another hit for me! Toad is tough and says whatever he needs to in any given situation, which gets him in trouble sometimes. He's devastated when he gets tossed out of the Ramblers, his band of thieves, and wants to prove he belongs with them. He only knows the life of a thief so has no problem lying to Melena to get her to help him. The ingredients they need to find I read The Tale of Mally Biddle by M.L. Legette last year and loved it so I was excited to see that she had a new book out! This is another hit for me! Toad is tough and says whatever he needs to in any given situation, which gets him in trouble sometimes. He's devastated when he gets tossed out of the Ramblers, his band of thieves, and wants to prove he belongs with them. He only knows the life of a thief so has no problem lying to Melena to get her to help him. The ingredients they need to find for Mr. Owl are all rare so they have some crazy adventures on the way to collect everything. Melena searches for her brother, Milo, the entire time. She was separated from him after a fire and just wants him back in her life. Toad comes in possession of Joe, the enchanted beer mug (excerpt below), and Melena thinks he's creepy and wants nothing to do with him. Over time, as she realizes what Joe can do, she softens towards him. Hazel, Melena's miniature Spit-Fire pet dragon and Agatha, the spider, were also great characters and added fun elements to the story. There's plenty of action and they get in a lot of tight spots. The solutions were creative and I was interested to see what would happen next. M.L. does a great job of moving the plot forward so it's never stagnant and there were parts I couldn't read fast enough. I didn't have time to read it with my kids before my review but it's a great middle-grade read and one we will add to our stack! Young Toad might be excellent of snatching a meal when he is hungry but he has been the downfall of several thefts when he is finally thrown our of his beloved Ramblers, a gang of thieves. Melena Snead, raised in an orphanage and adopted out to be a servant in an apothecary shop, just wants to restore what she can of the family she lost in a house fire when she was only 3 years old. Fortune puts this unlikely pair on an adventure to track down ingredients for an obscure potion. With a talking be Young Toad might be excellent of snatching a meal when he is hungry but he has been the downfall of several thefts when he is finally thrown our of his beloved Ramblers, a gang of thieves. This book is full of action and adventure. It pulls together 2 apparently mismatched young teens who both have a wish to belong. There are also plenty of mysteries: what happened to Melena's brother Milo, will Toad find his father who left him with the Ramblers, what the potion the ingredients make do, and how did a beer mug get enchanted in a world with little or no magic? I would hand this book to tweens and teens looking for a fantasy adventure. I would also suggest it as a family read-aloud with any school-aged children. The Orphan and The Thief is a YA fantasy tale which was a delightful read even as an adult. Toad is a thief and a member of the Ramblers, a notorious gang. Forced to part ways with the gang, Toad is determined to prove himself, landing in a sticky situation he manages to get a very important job for the sinister Mr Owl. Melena is an orphan who works for an apothecary, she is quick to study potion making, but her whole life surrounds her need to find her long lost brother Milo. Toad and Melena bec The Orphan and The Thief is a YA fantasy tale which was a delightful read even as an adult. Toad is a thief and a member of the Ramblers, a notorious gang. Forced to part ways with the gang, Toad is determined to prove himself, landing in a sticky situation he manages to get a very important job for the sinister Mr Owl. Melena is an orphan who works for an apothecary, she is quick to study potion making, but her whole life surrounds her need to find her long lost brother Milo. Toad and Melena become unlikely partners in an adventure to collect a list of rare potion ingredients. They meet some wonderful characters and I particularly enjoyed reading about the game of cards and skill called "Bloodroot and Toadstools". Set in a world full of magic and fantastical creatures, Toad is a thief that has landed in a bit of trouble. He barters his way out of it by offering to gather ingredients for Mr. Owl thinking he can steal them from an apothecary. Only to find out that they are almost impossible to acquire. He happens upon Melena who is an orphan looking for a better life and through lies gets her to help him on this quest. Along the I received a free copy of this book for an honest review. Along the way they encounter magic beer mugs, fearsome slinkwing dragons, and even find some friendship. There is much fun to be had. We are definitely 'bookworms' in our house and the children have an unending appetite for good books, so it was a pleasure to come across this beautifully written and imaginative tale by M L LeGette. Quite magical it paints a vivid picture for young readers with its extraordinary tale of magical creatures and faraway places. Certainly a book to be treasured! Absolutely wonderful children's book. Engaging and beautifully written with the stamp of a marvelous imagination all over it. What more can I say except read it to your children and they will thank you for it. Borrowed from NetGalley for an honest review. I absolutely adored this. I thought it was well written, funny and exciting. The author did a very good job of weaving a magical adventure and creating such wonderful characters. The Orphan and the Thief is an exquisite little read that will whisk any child away to a magical land. Beautifully written which many memorable characters it has 'classic' stamp all over it. What more can I say but excellent. 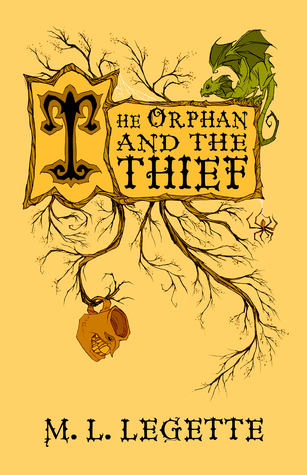 The Orphan and the Thief is a fun, young reader, fantasy that finds two youths on a quest. While one has taken on the quest so that he can stay alive, the other joins with the intention of earning money to find her missing brother, Milo. Little does Melena know that Toad has lied to her and there will be no money to be earned, even if they are successful. Both Toad and Melena end up finding themselves in multiple situations were their lives are in peril. Will they be able to track down the five The Orphan and the Thief is a fun, young reader, fantasy that finds two youths on a quest. While one has taken on the quest so that he can stay alive, the other joins with the intention of earning money to find her missing brother, Milo. Little does Melena know that Toad has lied to her and there will be no money to be earned, even if they are successful. Both Toad and Melena end up finding themselves in multiple situations were their lives are in peril. Will they be able to track down the five items for the mysterious Mr. Edward P. Owl and his massive bodyguard, Mr. Ogg? Or, will the harrowing adventure they find themselves on lead to their doom? There is a lot to keep you entertained in this enchanting fantasy adventure by M.L. LeGette. I quite enjoyed both of the main characters, Toad and Melena, along with her pet dragon, Hazel. I found Joe, the Bewitched Beer Mug of Thieves, to also be an interesting character, even if he is only a magically created mug that has a face . . . and can talk . . . oh, and can perform magic. Plus, there is Miss Agatha, a spider that can spin a web with an opening in it that will let anyone who enters the opening be transported to some other location. To top it off, there is the supporting cast of both bad and good guys they either hinder or help the two youths out on their quest. I liked them all. The quest to find the five items is an entertaining one. I quite enjoyed each one and rooted for the two as they made their way to various locations. I thought the author spun a magical tale of daring adventures that is sure get the heart pumping of any young reader that decides to delve into this story. Melena doesn't remember her parents, who died in a house fire when she was very young, or her brother. Melena's hunt for her long-lost brother is a nice addition to the story and I felt for her loss. After all, Milo is the only true family that she has left, and the only thing she knows about him is his name. She doesn't know how old her is, or what he looks like, or even if he is still alive. But she is determined to track him down, even if it takes ever penny she owns. I started reading this book over a year ago on my Kindle. I'm not sure what happened, because I don't remember, but for some reason I never wrote the review. I also lost all my notes on the story. So, I sat down on Christmas day and started reading it again. Boy, am I ever glad I did. Sure, I remembered some things about the story, but not everything, like who Milo was. This is a thoroughly entertaining story that was worth reading over again; at least it was for me. I hope that the author writes another story with Toad and Melena, as they should continue to travel the land looking for lost treasure. I would definitely read that too! Overall, The Orphan and the Thief is a great story that kept me turning pages late into the night. The story grabs the reader by their collar, shakes them around a bit, and then drops them on their rear with and astonishing thump. Yep, the story is that entertaining. Young Readers of all ages will enjoy reading about the quest of Toad and Melena and all of the interesting people and character they meet along the way. I highly recommend this book to any lover of adventure and fantasy. I look forward to reading the next book by M.L. LeGette, whatever that may be. Воришка-неудачник, девчушка-сиротинушка, огнедышащий дракон размером с кота, говорящая пивная кружка и квест по поиску редчайших и бесценных ингредиентов для зелья. Если кто-то и думал, что у этих ребят ничего не выйдет, то это точно не я. И да, повторяю: ГОВОРЯЩАЯ ПИВНАЯ КРУЖКА. Впервые со времен знакомства с Северусом Снейпом я оказалась поглощена зельеварением. Во вселенной The Orphan and the Thief зельям уделяется неприлично много пространства, главная героиня Мелена так вообще мастер-самоучк Воришка-неудачник, девчушка-сиротинушка, огнедышащий дракон размером с кота, говорящая пивная кружка и квест по поиску редчайших и бесценных ингредиентов для зелья. Если кто-то и думал, что у этих ребят ничего не выйдет, то это точно не я. И да, повторяю: ГОВОРЯЩАЯ ПИВНАЯ КРУЖКА. Впервые со времен знакомства с Северусом Снейпом я оказалась поглощена зельеварением. Во вселенной The Orphan and the Thief зельям уделяется неприлично много пространства, главная героиня Мелена так вообще мастер-самоучка, изучившая эту науку по одной занимательной и несомненно толстой книге. В какой-то момент герои даже играют в карточную игру под трудновыговариваемым названием, в которой необходимо найти все ингредиенты для зелья, собирая их из колод разных цветов. И зельделие не считается каким-то магическим занятием: всего-то смешать травки да ягодки, и вот тебе лекарство от насморка. Или смертельный яд, смотря как дело пойдет, какой выдержки будут корешки и в каком котле их варить. Автор не открывает континенты, она тасует уже известные и полюбившиеся атрибуты различных фэнтезийных миров. На отдаленных островах живут птицы из рода Рух, у некоторых лечебных водоемов обитают драконы, единороги пьют только из определенного озера, а в лесу запросто можно встретить огра. Меня начало откровенно штормить только когда появился один отдаленно знакомый пират) А средства передвижения? Чего стоит одна только волшебная пыль, щепотку которой надо насыпать в ноги и выкрикнуть желаемое место назначения (ладно хоть камины ни при чем). Мелена – откровенная Гермиона, книжная заучка, которая, по счастью, умеет применять свои знания на практике. Скромняга с обостренным чувством справедливости, в поисках своего брата она готова ринуться выполнять даже самое опасное и трудное задание. Ее уравновешивает Тоуд из банды воров, бесцеремонный пацан, бесстыдно вешающий лапшу на уши. The Orphan and the Thief is a charming adventure tale of, as you might guess, an orphan and a thief. The orphan girl, Melena, is a responsible, hard-working young woman she is trying to save up money so she can hire a private detective to find her lost brother. The thief, Toad, is a street-smart thief, who is kicked out of a street gang and forced to work on his own. These two polar opposites team up to go on an adventure to find some rare ingredients for an unknown potion for a man named Owl. Fr The Orphan and the Thief is a charming adventure tale of, as you might guess, an orphan and a thief. The orphan girl, Melena, is a responsible, hard-working young woman she is trying to save up money so she can hire a private detective to find her lost brother. The thief, Toad, is a street-smart thief, who is kicked out of a street gang and forced to work on his own. These two polar opposites team up to go on an adventure to find some rare ingredients for an unknown potion for a man named Owl. From the moment they start their mission, they have non-stop excitement as they move through searching for ingredients strewn all over the place. I have to admit that when I first saw this book blurb with Mr. Toad and Mr. Owl, I was thinking it would be like a Wind in the Willows type book, but it is not. So don't be surprised when you find that the characters are all human, except the dragons, and the spiders, and the talking beer mug. Despite the initial confusion, I enjoyed this book from the very beginning. The author has a fun active voice that made even walking around an empty field for days, seem fun. The main characters' stark differences made for many fun conversations and experiences as they trek around the world looking for the ingredients. Speaking of the characters, I loved them. I really came to know them and enjoyed watching them grow and progress through the story. My favorite character was Melena. Through the book I felt she grew the most, but the author made that happen in a way that felt natural, and not forced. Although completely out of her element, she was the stable force in the duo and I found myself rooting for her. I also really enjoyed that the book was self contained. The author could have stretched it out into having a sequel, but wisely kept it in one well written and fun adventure book. Although the characters and setting are well developed and could be in another book, this adventure has closure, which I really like. This book is a great clean family friendly book written for middle-grade students. I feel very confident recommending it to anyone who wants a fun clean adventure. I'm excited to see what my daughter thinks about it. She can be a harsh critic of books, and I have a feeling she will like this one. The Orphan and the Thief is a quest type book written for middle school kids who like anti-heroes and adventuring. The story features standard european myth fare: rocs, trolls, unicorns, witches, magic portions. And if I'm being honest, the characters are also very typical: weepy, overemotional, uptight girl and thoughtless, aggressive, boastful boy. Neither characters were very interesting and the plot did drag for me, especially in the beginning. Plot: Melena is an orphan working for very ungra The Orphan and the Thief is a quest type book written for middle school kids who like anti-heroes and adventuring. The story features standard european myth fare: rocs, trolls, unicorns, witches, magic portions. And if I'm being honest, the characters are also very typical: weepy, overemotional, uptight girl and thoughtless, aggressive, boastful boy. Neither characters were very interesting and the plot did drag for me, especially in the beginning. Plot: Melena is an orphan working for very ungrateful shopowners. When she catches a young thief at night, she inveigles him into taking her along to find needed ingredients for an unknown spell. The thief, Toad, promises her all the gold she could need if she could use her knowledge of potions to help him find the rare spell ingredients. They only need five items - but finding those items will take them on a grand adventure with a surprise at the end of their journey. My 11 year old and I didn't really get into either character. Both lie, cheat, and steal to reach their ends, neither thinks through any of their actions, and they end up having to be saved constantly not by their own wits but by their 'pets' - a small dragon and an enchanted beer mug. As such, they aren't resourceful, just lucky, so there aren't a lot of good messages here I'd like to give me 11 year old. In truth, the cheating and lying both get them the tools they need to succeed in the quest and the girl constantly haranguing, "You shouldn't steal!" (without giving any reason why he shouldn't) becomes silly when it proves that if he hadn't, they'd have failed. It's like saying to kids, "don't listen to your conscience or your parents, they are just annoying you and ensuring you fail." And throughout, we have to listen to one or the other whine impotently at each other. It got old. The writing isn't terrible but it also lacks spark and nuance. I contrast this story to a similar themed but superior novel, Jinx by Sage Blackwood, which has all the witty banter but not the poor messages or dimwitted protagonists. My daughter and I like 'hip' or antihero children's literature and don't need a message in every book. However, personality and spark really need to make up for that lack. Unfortunately, neither happened in this book. Both main characters just seemed selfish and really bland. Toad is a thief. Unfortunately, he isn't a very good one. After botching multiple jobs, he is kicked out of his gang. Determined to prove himself, he breaks into the house of Mr. Owl. He is once again caught. Mr. Owl makes a deal with him. If Toad can collect a few items Mr. Owl needs, he'll let Toad live. Melena is an orphan. She lost her parents in a fire seven years ago when their house burned down. She was adopted by the awful Bells, so they could her use as an assistant in their potions shop. By chance, she happens to find a discarded potions book in the trash. As she gives it a try, she realizes she is much better at potions making then her adopters. She starts sells her concoctions at the shop's back door. She is squirreling her money away in hopes of saving enough to hire a private detective. She knows her brother survived the fire and is out there somewhere. Toad is a thief although not a very good one. He is cocky and overconfident. After he is thrown out of the Ramblers because of his incompetence, he decides to offer his services to Mr Owl, a very dangerous proposition indeed. Owl offers to let Toad keep on living in return for some ingredients to make a very special potion. Toad figures this should be simple enough, just rob a potions shop. In his usual bungling way, he manages to wake up Melena, an orphan and apprentice apothecary. She is tryin Toad is a thief although not a very good one. He is cocky and overconfident. After he is thrown out of the Ramblers because of his incompetence, he decides to offer his services to Mr Owl, a very dangerous proposition indeed. Owl offers to let Toad keep on living in return for some ingredients to make a very special potion. Toad figures this should be simple enough, just rob a potions shop. In his usual bungling way, he manages to wake up Melena, an orphan and apprentice apothecary. She is trying to save enough money to hire a private detective to find her brother so, when Toad tells her (untruthfully) that Owl will pay a lot of money for the ingredients, she decides to help. When she finds out what Toad is looking for, she knows he won’t find those ingredients in any store. The pair set out with Hazel, Melena’s pet spit-fire dragon, on an adventure that will take them to some very dangerous places as they gather the ingredients. Along the way, they will find a magical beer mug, a golden spider that can spin portals, lots of thieves and pirates and, most important of all, friendship. The Orphan and the Thief is a fantasy tale aimed at middle graders but would be suitable for even younger kids. There’s plenty of action, wonderful characters, magical creatures, and enough twists and turns to capture the attention of even the reluctant reader and with enough humour to provide enjoyment to adults – a perfect rainy day read or bedtime story. Happily, this is a standalone tale although a sequel would definitely not be remiss. The characters are well developed and I learned something from each of them. Toad and Melena are likeable kids who share a huge adventure for different reasons. The story is split between each of their points of view. I enjoyed Izzie, Agatha and Joe. I think there is a lot more to learn from and about Izzie, if the author decides to write a sequel. I like the underlying theme of the book which is (for me, at least) that characters come into our lives at different t What did I like about this book? I enjoyed Izzie, Agatha and Joe. I think there is a lot more to learn from and about Izzie, if the author decides to write a sequel. I like the underlying theme of the book which is (for me, at least) that characters come into our lives at different times and seasons to teach us something and we shouldn't take them for granted--from a magical spider to an enchanted mug, to the kid who lives in a den of thieves. The action and adventure are paced well from beginning to end with edge-of-your-seat suspense and rest periods where I could catch my breath and absorb new information. The author did a good job with the world building. It reads like historical fiction. This is a fascinating tale of a girl and boy who engage on a quest together, each thinking that the other needs their help. I read the first section of this book with enjoyment, but was surprised when I stopped that I seemed to have read so little. I don’t know whether the book is longer than usual, but it was a struggle to get through the first half. There didn’t seem to be any reason for this; the book is well-written, the characters should be engaging, as they are lively and personable. The fa This is a fascinating tale of a girl and boy who engage on a quest together, each thinking that the other needs their help. I read the first section of this book with enjoyment, but was surprised when I stopped that I seemed to have read so little. I don’t know whether the book is longer than usual, but it was a struggle to get through the first half. There didn’t seem to be any reason for this; the book is well-written, the characters should be engaging, as they are lively and personable. The fantasy world is fully developed and the quest is inventive, without too many tropes. It wasn’t until we reached the home of Izzy Groot that I really settled into the book. This may have been because this episode included details of potions, which piqued my interest with their detail and believability (as well as my admiration for a beautifully imagined card game). I think the writing flowed much better from there, but the ending was not unexpected, although I think the author felt it was a surprising twist. My favourite character was Hazel, the dragon. I hope we see more of her. Charming cover for an even more charming book. I received an digital version of this book during a giveaway by the author on her blog and while both the plot and the reviews were promising and I was indeed quite curious to read it myself I wasn't 100% sure I would have liked it. I tend to appreciate books aimed at younger readers but they sometimes fail to keep my attention focused on what's happening. This book didn't fail. The main characters were engaging, believable and likeable. The plot flow Charming cover for an even more charming book. I tend to appreciate books aimed at younger readers but they sometimes fail to keep my attention focused on what's happening. This book didn't fail. The main characters were engaging, believable and likeable. The plot flowed smoothly and if the solutions to the various obstacles were sometimes a bit semplicistic they were still logical and didn't ruin the story. This was a fun read! There was so much heart and adventure! There were so many aspects of this story that felt like a life lesson and yet it was filled with so much fun and great characters. As I was reading this story I kept thinking how great this would be for young adults. There were aspects that were very fairy-tale like and other parts that were very real and reflected the realities of life. Toad and Melena made a great team. They were perfect opposites and per Received for an honest review. This is a great book for kids. I liked the themes of family and friendship. Lots of adventure and magic.